I like to bribe myself to have a good attitude for being on call for my job.Sometimes I buy myself a new purse, sometimes it’s a pretty dress. 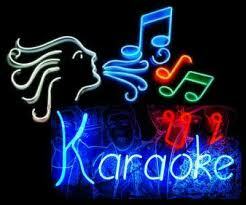 This evening’s good on call attitude is due to karaoke with my friend Melissa tomorrow night! I’ve been in a singing mood for a couple weeks now, but haven’t had a chance to sing for a ‘real’ audience (probably a good thing). I’m in desperate need of some new song ideas. My range is sort of in between a mezzo-soprano and an alto. Please help! I can’t keep singing Broken Road and I Hope You Dance every single time. I might even allow myself to be taped and upload the video to my next blog. Maybe. No promises or anything. I’m kind of shy in real life. Karaoke also means people watching, which always provides an excellent dose of inspiration for my writing. I’m still looking for a strong male name for a character. I don’t think he will be fully developed until he finds that name, and I’m verging on desperate. Perhaps the name will come to me on karaoke Thursday. Please provide song ideas if you can, or male name ideas…providing me with the perfect name would most definitely inspire me to post something embarrassing of myself in return. Maybe some funny poetry from when I was twelve, like the poem about the punnet square or the size of my feet. It’s healthy to laugh at yourself once in a while. Ohhhh, or if I know you personally, then you should come sing with me! I do love to duet. Rumor Has It by Adele and Cheers (Drink to That) by Rihanna are perfect for a night out! As for the name, oh my, it really depends on what this character is, where he’s from, what he’s supposed to represent, and a thousand other factors. You should really just try to imagine him inside and out in every minute detail and the name will just pop in your head!